Mr. G's musings: Do you know how to order your STEAK? A great Huntington Post article today about how to order a steak to be cooked the way you prefer. I like 'em "blue". How 'bout you? Over the decades, I've ordered steak "rare" and it is usually deliver anywhere from "medium rare" to "medium well." Which is infuriating if your paying $50 for a slab of beef. I learned about the term "blue" and have found satisfaction with my steak orders since. 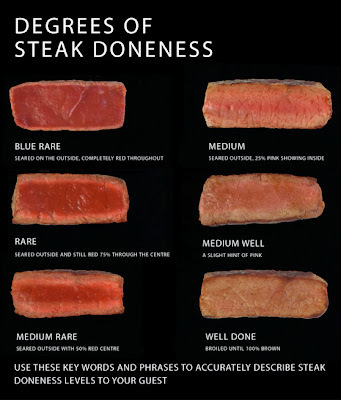 Maybe this chart will help you know how to ensure you get your beef cooked to you preference. I find that the cheaper the steakhouse/restaurant, the less willing or the less understanding they have about these nuances. I LOVE STEAK!